when death is cheaper than living, and less embarrassing…. I met a couple last week, married 68 years! Sharing a little apartment in an assisted living community, they sat at the table in their tiny kitchen talking with me. As we talk, I’m noticing how good looking they both still are, appreciating great bone structure in their 90-some year old faces. Is that weird? I wanted so badly to see a picture of them as newlyweds, they must have been blindingly attractive back then. Now he’s scooping out raisins on their plates, and she’s crumpled in her chair, her body isn’t keeping up quite as well as her lovely face. She can’t see much anymore, can barely walk, they don’t like to leave the place because it’s just too much work. She laughs too, but tells me “it’s too expensive to live”, she’s serious. They feel like they’ve overstayed their welcome here… but don’t know how to make a graceful exit. They aren’t the only ones, I hear this a lot. Cute lady today, almost 100. Fought with her son about wanting to keep her own house, take care of herself, she didn’t need any help. He took the knobs off her stove because she left the water boiling once. She is very neat, pretty too. bright blue eyes, and a flowered headband. So tidy and precise as we talk. She’s embarrassed that her son caught her in a moment of weakness. Embarrassed that she fell and had to crawl to the bathroom, trying to pull herself up on the toilet so she could stand again. Almost bewildered to find herself in this predicament…. Sighing as she talks about how her son put his foot down, she’s not allowed to go back home. Planning to sell her house, not sure how much time she should plan for…. How does it feel to get to that point, when person feels like they should possibly apologize for living too long? How can we do this better?? She wanted to talk to me. She’s having trouble sleeping, but doesn’t want the kids to know. They already worry too much about her. She doesn’t want to be a burden, already feels like she’s a burden. Her daughter called her three times during our talk, our 20 minute visit. They worry about her, they push her to do things for herself… walk more, exercise, socialize. But she’s tired of pushing herself. She’s sad, and anxious, and not demented at all. She’s smart, but her body can’t keep up with her mind. When did the roles change? Why do they make decisions for her? Why do they tell her what to do, when to do it, how to do it? She always feels like she’s disappointing them. She can’t reach the goals they set. Her frailty frustrates her. She’s letting them down, they deserve better, she’s just in the way. How can she stop feeling like a burden? How can she stop them from feeling like she’s their responsibility? I’ll bet she can remember holding her chubby babies. Feeding, bathing, loving them. Nurturing them, raising them, watching them grow up as she grew old. I see her. I SEE her. One day, I could be her. My words don’t fix things, but she’s grateful for the time we spent. I can’t change how she feels, and I can’t make them feel like they don’t NEED to care for her. It’s out of love and the duty that comes with love. The other day, my sister and I went somewhere together. Sometimes, we do that. I smiled, but my mind was racing….. did he just….? did he just ask me if I was her MOTHER? Looking at my sisters smiling face. No, she wasn’t just smiling. She was laughing. We continue on, stepping into an elevator. I’m inspecting myself in the reflection. “It’s the sweater…. it’s a total mom sweater….”. I asked one of the people in the elevator, “do I look like I could be her mom? !” He looked confused. “NO!”, I helped him with the correct answer. “I DON’T!”. Clearly….. the first guy may have been completely blind. I don’t even remember him having eyes to be honest. I give you exhibit A. A recent photo of two SISTERS at a play together…..
Hmmmm, so maybe I do tend to look overall more subdued. More mature in a very young and not mom-ish way. Definitely don’t look like I gave birth to that lady with the chopsticks…. Oh, well isn’t that precious. She was my little bitty baby sister….. and I doted on her and probably did pretend to be her mommy back then. Just look at that little face…..
You know what? It’s really ok. I do kind of feel like a mom to her sometimes, I practiced my parenting technique on her before trying it out on my own kids…. thanks to the mistakes I made with my sister, my oldest has turned out pretty awesome. 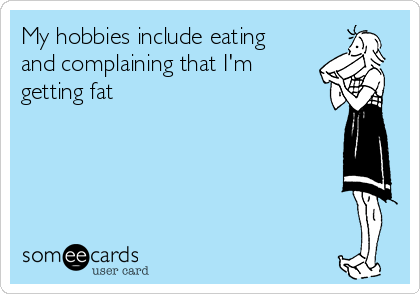 Until this past year, I have lived my life blissfully ignoring “recommended calories” when I felt like it. I knew I ate horribly, but figured that box of swiss cake rolls I gobbled in the darkness of the pantry would be offset by the lack of breakfast or lunch on most days. My night snacking was enjoyable. And again, in the spirit of refusing to face reality, I chose to believe that all the crap I ate right before bed would just kind of….disappear, and I’d have a reset the next day. Why not, that’s how it’s always worked! I was blessed by genetics, taking after my mother who had 5 kids, never exercised, and always had a tiny waist. My hip bones stood in proud defiance of the calories I ingested. But one day, I noticed that my scale wasn’t working right anymore. In fact, it seemed to be stuck higher than I was used to. Then it went higher. I started to worry….. and finally panic as weeks went by, and the number never went down. Instead….it crept up. Suddenly, I’m noticing a new softness across the midsection…. at the waistband…. and I consider my options. I won’t say I’m not very interested in smart lipo. I absolutely am in love with the idea…… except I would literally be spending my kids tuition to get it, so I sigh, and consider some more. I’m no stranger to exercise, but still struggling to fit it in the schedule with these kids, and this job, and all this other stuff going on… and let’s face it….. working out for 20 minutes, and then stuffing my face with a chocolate lava cake is probably not going to help much. I did recently download this app, called MyNetDiary. It counts calories, tracks weight, give access to all sorts of tips and articles about weight loss, working out etc. I started plugging in what I ate, even more motivating was the option to scan barcodes… if only I ate more packaged food… it’s so fun to scan and see everything pop up for you! I started this about 2 weeks ago. I’ve quickly become addicted. I put in my current weight, my goal weight, my level of activity, and a date I want to achieve my goal. I weigh myself in the morning, and log my food, even glasses of water. It really works!! For once, I feel like I have something keeping me in check when I go scavenging for sweets, although it was depressing to find out that each starburst has 40 calories. I’m actually starting to think about things being calorie-worthy….. am I finally a real grown up? Today we had lunch with my mom for Mothers Day. Olive Garden…. who can survive that??!! I ate 2 breadsticks, all the while fuming about the 300 calories they were costing me. Still smothered them in alfredo sauce. Salad, a scoop of shrimp scampi from the lighter fare menu, and half piece of tiramisu. I think I usually eat a lot more than I did, but for the first time I was aware and made an effort to eat within my limit for the day. Since then I’ve had 2 cups of tea, and more salad. That’s it. I did go over calories, but only by 161—not the zillion it would have been. And I’ve lost 3 pounds. First thinking it’s a fluke, but it seems to be real. I love to look at the graph and see the downward trend. It’s so motivating! Oh, I’m not going to give up my pantry snacking completely, one must have some joy in life….. But finally, I think I might be motivated enough to stick to something. And I am working out more, running in fact! (well, jogging…. in a slow and painful, gasping way). In fact, this is how I started my Mothers Day today…..
By the end of yesterday I seemed more aware for some reason of the amount of yelling I do each day. I don’t think anyone can hear me if my voice is not at least moderately raised, and each request must be repeated at least 5 times. I remember attempting to lecture Sammy at the store about how his repetitive behavior and ignoring of my requests to stop were just going to hurt him in the long run…because I certainly wasn’t going to bother getting him the frozen sorbet treats we specifically came for. Thankfully they didn’t have them anyway so I couldn’t give in. But it doesn’t matter. Every day, EVERY DAY….. they must test me. I’m pretty convinced it’s their only purpose for being here right now. They haven’t found a greater purpose yet, so will continue to poke away at my sanity until they find something better to do. Sometime last night, getting them ready for bed…. I’m again lecturing about how tired I am of repeating myself, and repeating myself, and repeating myself…..
My eyes might have looked a little bit crazy. I could feel creases forming on my forehead… creases that were not there before…. and they felt like they were just getting really settled and comfortable in my now regular facial expression of crumpled brow and squinty eyes. And then Jenna said she refuses to play with me again until I kiss her and say I’m sorry. And I’m just trying to hold my forehead from caving in all together. 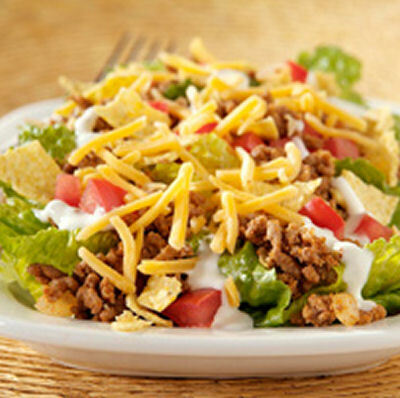 I want a taco salad. I don’t want to make one, I want one from taco bell. I don’t eat these very often, but today I want one. I resisted the urge all day, but tonight it’s calling to me from across the road as I stir this delicious dinner of vegetables with green curry. I’m not being sarcastic here, it’s really good. But it’s not a taco salad and so is not going to satisfy me. I couldn’t get one for myself. I was rushing with the kids to get them home and in bed, having just brought soup to my own mom who isn’t feeling well. She told me not to come, but I knew she would eat the soup… ended up driving home later than I thought, and although I pass taco bell, I just couldn’t justify wasting the time for myself. Running upstairs to get them to bed, see the oldest sitting on her bed, hasn’t gone out with her friends yet. PERFECT. I throw out another please but don’t have time to grovel as I start the bed time ritual for the two little ones. But time passes, and she doesn’t come back. I notice a text on my phone. It’s from her, she’s going out with her friends. I’ve lost hope. After this revelation… a little passive aggressive texting back and forth, me trying to ensure she feels guilty and suddenly realizes how much she loves and appreciates me, and how much I DO FOR HER… her focusing more on the fact that I seem to be upset about a taco salad, and not the meaning BEHIND IT…. Because this obviously means that I will end up in “a home”. Alone. Discarded as soon as I am no longer useful. Currently working on a way of avoiding this, while also ensuring all remaining children find it impossible to say no to me for any reason.